Take a look around Puddle Duck Cottage. It’s a luxurious cottage in the beautiful Ironbridge Gorge, which feels like home from home. My family and I were invited to stay in Puddle Duck Cottage, as guests of Puddle Duck Cottages. Although I’ve lived in Shropshire for most of my life, there are still areas that I have yet to explore properly. And one of these areas is the beautiful Ironbridge Gorge. So last month, my family and I headed over to Jackfield to stay at Puddle Duck Cottage. And even better, we were able to take Charlie the Chihuahua along with us, as the Puddle Duck Cottages are totally dog-friendly. The cottages were featured in the Telegraph as a top place to stay, and offer a self-catering break for those who love a touch of luxury. The Ironbridge Gorge is a UNESCO World Heritage Site, and is regarded as the birthplace of the Industrial Revolution. Ironbridge itself is famous for the first ever cast-iron bridge which was built in 1779 over the River Severn. It was designed by Abraham Derby III and cast in the foundry at Coalbrookdale. Puddle Duck Cottage lies around a mile downstream from Ironbridge, in the village of Jackfield. Like many of the towns and villages in the area, it played an important part in the Industrial Revolution. The Ironbridge Gorge is a wonderful place for a weekend away or a longer break. It’s easy to reach, as the M54 motorway passes through nearby Telford and buses regularly serve the town. There are many local museums to explore, great places to eat and gorgeous countryside to wander through. It’s also a great base for exploring Shropshire and further afield. Driving through the roads down to Ironbridge feels like driving back in time, to a time when life was lived at a slower pace. We were lucky to have good weather when we stayed at Puddle Duck Cottage. And as we drove through Ironbridge and out towards Jackfield, I could feel the tension lifting from my shoulders. We pulled up into one of the two parking spaces provided for guests staying in the cottage, and I knew that we were in for a very special weekend. Puddle Duck Cottage looks like something out of a fairy tale or picture book. 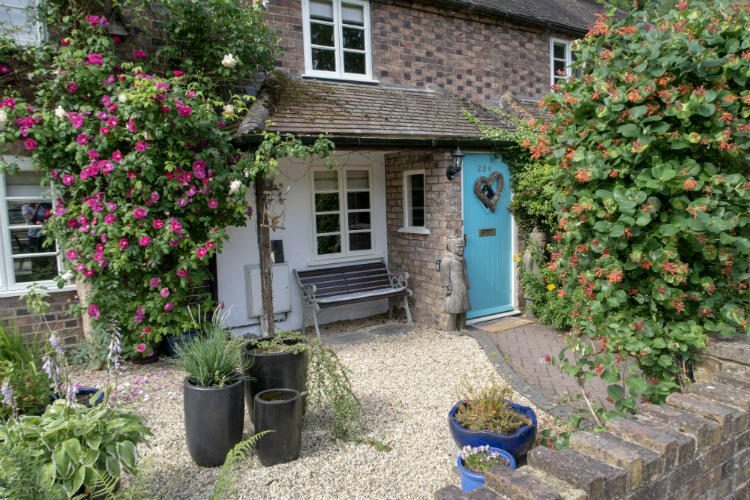 It’s a beautifully quaint little cottage that dates back to the Industrial Revolution. The little white gate is framed with honeysuckle and clematis which were in full bloom when we arrived. The front garden overlooks the River Severn and a little bench makes a perfect place to sit out and enjoy the Shropshire countryside. Puddle Duck Cottage sleeps six people while its sister cottage next door, Duckling Cottage, can sleep up to five. We went through the pretty front door, and into the haven within. The front door opens directly into a long and spacious cottage-style kitchen. The cottage is decorated thoughout in cream and muted shades of blue and pink, which gives it a very peaceful and relaxing feel. Sonia and Darren, the cottages’ owners, had left us a welcome card by the front door. It was the first of many lovely personal touches throughout the property. There is a large range-style electric oven, microwave, toaster, and a good sized fridge/freezer. Meanwhile the kitchen cupboards are filled with all the cooking equipment you could need. The cottages can be booked together for larger groups, and Puddle Duck Cottage has been designed with this in mind. The kitchen is very well equipped with a large table and plenty of seating, and lots of cutlery and crockery. If you are renting both cottages, you can easily meet up for meals in Puddle Duck. And the welcome package ensures that you are well stocked for your first night in Puddle Duck Cottage. You’ll find milk, fresh bread and butter, salt, pepper and oil, washing up liquid and dishwasher tablets. Even better, you’ll also find a bottle of wine and a cake. Sonia tells me that if you are renting both cottages, she makes sure that each cottage has a different cake, and there will be one bottle of red and one of white. And I love that the kitchen is equipped with jars filled generously with tea, coffee and tea bags. So much more practical and welcoming than little sachets of sugar and individually wrapped teabags! Puddle Duck Cottage is a perfect location for a self-catering holiday. But if you don’t fancy cooking, then there are plenty of opportunities for eating out in the local area. The information folder left near the front door contains several recommendations for pubs and restaurants within walking distance, several of which are dog-friendly. And there’s an even wider choice if you venture into Ironbridge itself. We ate at the Swan Taphouse on the Sunday afternoon, and really enjoyed their range of locally sourced foods. The BBQ Brisket was melt-in-the-mouth tender, and their chunky hand-cut chips were out of this world! Or for the best of both worlds, you could call out for a takeaway. We ordered in from Zengh, and I definitely would rate it as one of the best Indian takeaways I’ve had. The kitchen/diner leads on into the living room. The peaceful cream and blue colour scheme in here gives the room a very tranquil feeling. And there are lovely decorations around the cottage, which I enjoyed spotting throughout the weekend. As with the kitchen, there is plenty of comfortable seating in the generous sized lounge area. If you are renting both cottages, you could all congregate in this room in the evenings. And the sofas have removable covers, so I didn’t have to worry about Charlie damaging them. Actually, Charlie can be a bit fussy when he is in a new environment, but he soon made himself at home in Puddle Duck Cottage. He decided that the corner seat was his spot, and was quickly snoozing away. He also slept very well at night, which is quite unusual when we go away for the weekend. Sonia made sure that Charlie was well catered for as well. There were dog bowls and a pot of poo bags supplied in the kitchen, and even a brand new chew toy to welcome him to the cottage. But if no-one had told me that this was a dog friendly cottage, I never would have guessed. It is absolutely spotless throughout, with no sign of previous visitors. So if you’re not a dog lover, you can rest assured that this is a perfect place for you as well. The cottage has thick stone walls, and stayed beautifully cool inside during our visit. But if you feel the cold, there is central heating throughout and a log burner with a welcome basket of logs and kindling. Can’t you just imagine curling up in front of that on a cold winter’s night? There is a TV and DVD player, and a selection of books, DVDs and games to while away the evenings. Because of the landscape of the Ironbridge Gorge, mobile phone signals in the area can be troublesome. I found that I couldn’t get any mobile reception at all inside Puddle Duck Cottage, and it was intermittent outside. However, the cottage has WiFi and if you have WiFi calling enabled, you can make phone calls that way. But I found it quite relaxing to not be at the beck and call of my phone for the weekend. The cottages would make an ideal location for a digital detox. From the living room, you can go out into the pretty courtyard and garden behind Puddle Duck Cottage. This is a very private space with a small lawn, patio area and a table and chairs. If you like to eat outside, there is also a BBQ provided for guests to use. The garden backs onto a wooded area, which makes it feel very secluded. I loved sitting out here in the evenings, breathing in the beautifully fresh Shropshire air and listening to the birds. If you rent both Puddle Duck Cottage and Duckling Cottage together, the inter-connecting gate between the gardens can be opened up. This makes it easier to get from one cottage to another, or allows you to mingle in both gardens. It really would be a perfect location for a family get together or weekend away with a large group of friends. I love the quirky design touches throughout the cottage and its gardens. Isn’t this little dog cute? And I really appreciated the solar-powered night light that comes on after dark in the garden. It made Charlie’s 2am trip outside to the garden a lot easier to manage. Puddle Duck Cottage has three bedrooms, and can sleep up to six people. Now, at this point I have to admit that I struggled to take photographs in some of the rooms. They all have gorgeous low-set windows, which look incredibly cute and charming but made lighting for photographs a little tricky. My photos definitely don’t do the rooms justice, and I have to apologise for that! So the master bedroom has a very dramatic superking bed. It looks stunning, is incredibly comfortable and I slept really well in this bed. There are plenty of towels provided, and lots of storage space for unpacking your clothes and belongings. And the peaceful surroundings and comfortable bed made for a fantastic night’s sleep. The second bedroom has twin single beds, which can be made up as a second superking bed if required. The smallest bedroom in Puddle Duck Cottage has custom-fitted cabin bunk beds, which means that this room can also sleep two people. The top bunk is accessed by a little staircase at the end of the beds, which just looks so cute! Lyle loved sleeping in here, and it really reminded me of the loft bedroom that Heidi had in the 1970’s TV series. There is a bathroom on the upper floor of Puddle Duck Cottage, with an over-bath shower. There is also a shower room that leads off the kitchen downstairs, which would be useful if you come in from a walk with a muddy pooch. Hand wash and shower gel is provided throughout the cottage. We all thoroughly enjoyed our time at Puddle Duck Cottage. It’s a wonderful mix of vintage and modern, and combines luxury with touches of home comfort. I was really impressed with the attention to detail in the cottage, and the high standard of finish in the decor. It looks elegant, feels luxurious, and yet I still felt very much at home. Sonia and Darren have obviously given a lot of thought to what goes into a luxury cottage break. And then they’ve taken it one step further, with personal touches. From the correspondance before the visit, the thoughtful welcome pack, the little extras for canine visitors, and the well-stocked information pack, this really is self-catering at a high level. On our last night in Puddle Duck Cottage, after everyone else had gone to bed, I sat for a while on my own in the living room. I felt so utterly relaxed, all tension gone from my shoulders. It was if I’d spent a week in a spa. Whether you are meeting up with friends, spending a weekend away with family, or just getting away from it all on a digital detox, Puddle Duck Cottage is truly a luxury escape from the modern world. We enjoyed a complimentary weekend at Puddle Duck Cottage, thanks to Puddle Duck Cottages. The minimum stay is two nights, and prices start from £180 per night and £550 for a weekend. Duckling Cottage next door is available from £130 per night and £450 for a weekend. Thank you to Puddle Duck Cottages for inviting us to stay in their beautiful cottage! I love Ironbridge. I use to live just down the road and it was great for a sunny day out. Puddle Duck Cottage looks so twee and quaint – everything you need for a holiday cottage. Oh my goodness, this place is incredible. It is so beautifully decorated and I love all the personal touches! This looks like a cosy and comfy place to spend a few days away from home. I’m looking for UK destinations to visit with the children when the schools break up and this really does appeal. My kids would love the bunk beds. Oh, my goodness, this places seems really amazing and the views are absolutely gorgeous. I wouldn’t mind bringing my family here for a nice staycation.